Submit a name for this Bow Tie by hitting "Add To List" button, then select "Item no link." Get votes for your bow tie name by sharing it with your network. The bow tie name with the most votes by 7/1/13 will be crowned the winner and get the naming rights for this bow tie and their name displayed on "The Bow Tie Flow"
The winner is entered into a raffle for a chance to a bow tie. 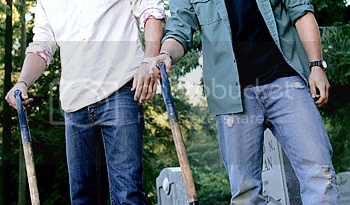 ...because the Winchester boys are hot. That is all.